New York Injury Lawyer | New York City Accident Attorney | Caesar and Napoli, P.C. Serious accidents occur every day in New York City — leaving innocent victims to deal with the aftermath. Working to overcome an injury, cover mounting medical bills, deal with insurance companies and recover lost wages cannot be done effectively unless you have help from an experienced attorney. 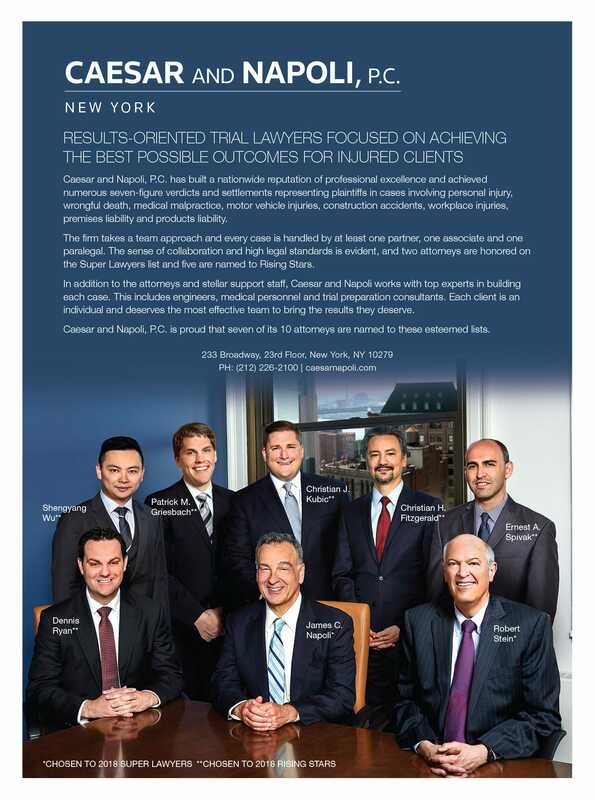 At Caesar and Napoli, P.C., our New York injury lawyers are dedicated to representing injured victims. We will fight for you, protect your rights, and work to reach the best possible outcome for your case. Caesar and Napoli, P.C. is a law firm in New York City that is focused 100 percent on personal injury cases. We represent victims and never advocate for insurance companies or large corporations. Our attorneys have years of experience and frequently receive referrals from past clients. Client service is, and always has been, our top priority. Our lawyers have decades of trial experience, in-depth knowledge of New York case law and a proven track record. Our team has been recognized by Super Lawyers, the American Association for Justice, and the National Trial Lawyers’ Top 100 Trial Lawyers for our commitment to diligently pursuing justice for our clients. 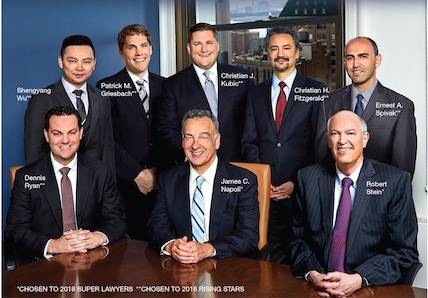 As a result of his unflagging advocacy for injured victims, founding partner James Napoli holds the distinction of being selected for New York Super Lawyer for six years straight. We understand injury cases from a 360-degree perspective, and we place a singular emphasis on the investigation and preparation of our clients’ injury claims. Understanding the discovery process and sparing no expense throughout the investigation helps our team most effectively present evidence in the courtroom, and ensure our clients get the maximum amount of compensation and benefits they deserve. We find that the strongest attorney-client partnerships occur when clients are fully aware of their legal options. We make certain that all our clients are comfortable with the law and how it works for their individual circumstances. This enables our clients to be in the best position to make decisions about their case. To that end, we are committed to keeping our clients informed and the legal process transparent. Our New York injury lawyers pride ourselves on being fully accessible to our clients, and our staff can be reached 24/7. We have attorneys and support personnel fluent in Russian, Spanish, Mandarin, Cantonese, Taosin, and Fukanese, so language barriers never pose an issue in our office.